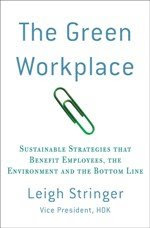 The Green Workplace: Good Morning America Features The Green Workplace! Good Morning America Features The Green Workplace! ABC’s consumer correspondent, Elisabeth Leamy, ran a story on “greenwashing” today. Greenwashing” is a term, first used in the 1990s, that refers to the act of misleading others regarding the environmental practices of a company or the environmental benefits of a product or service. For example, a bottle of toxic cleaning chemicals may have an image of lakes and forests on the front to give the impression that it is good for the environment. Or a product may be listed as “certified” green, but doesn’t say who certified it. Because greenwashing is a topic we address in The Green Workplace and because I’m pretty passionate about the topic, my daughter and I got a chance to say our peace on national television today about products that protest to be green and are not. Some market reports show that consumers are willing to spend up to 10% more for products they know are better for the environment, and many companies pray on this by slapping a green label on products that are not even close. Call it a pet peeve, but I believe it’s about time we started insisting on more comprehensive labeling. Comprehensive, but not confusing I might add. Leah -- Great piece. I'm planning to order the book right now.